Michael Duane Smith was born April 29, 1958 in Spartanburg, SC to the parents of RW & Ill. Bro. Donald L. and Patricia Tucker Smith. The first born of three children, Mike has a sister Kelley Cash and a predeceased sister Vicki Newman. He grew up in the small town of Landrum, SC, graduating with honors from Landrum High School. In 1981, he graduated from the University of South Carolina – Upstate with a Bachelors of Science in Biology. On June 20, 1981 Michael and the former Cheryl Lynn Gilliam were married and have two sons, Duane and Christopher both now members of the Landrum Lodge and Spartanburg Scottish Rite Bodies. Lynn is a retired teacher from Spartanburg County after 31 years of serving children and families. Michael began his current career with Milliken and Company in 1980 with the Research Division of Milliken and currently serves as Global Sales Manager with the Chemical Division. Bro. Mike was raised a Master Mason in September 1979 in Landrum Lodge # 278 and has served as Worshipful Master in 1987, 3° Lecturer and co-chairman of the golf committee for over 35 years. 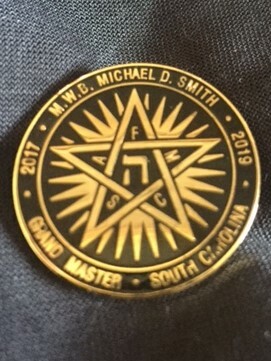 During his year as Worshipful Master, the Lodge began our community service programs that continue today and include the Landrum High School Americanism Award and Scholarship program, charitable support for Community Police, Fire and Rescue, Youth Sports teams and annual Worshipful Masters special project. Mike and Lynn served together and are Past Worthy Matron and Past Worthy Patron and current members of the Inman Chapter # 169 of the Order of Eastern Star. Bro. Mike served as a Trustee of the Spartanburg District One School Board for 12 years and served as Chairman of Board 2009 and 2010. He served as Personnel Committee Chairman and was Chairman of the local School Bond Referendum for the district leading to passage of a $ 67 Million Building program without a tax increase required to build 2 new state of the art high schools. In 1997, MW & Ill. D. Samuel Tennyson appointed Bro. Mike as the District Deputy Grand Master of the 20th Masonic District. He has served on the Grand Lodge Finance Committee, Masonic Education Committee faculty, and the Committee of Fraternal Relations. 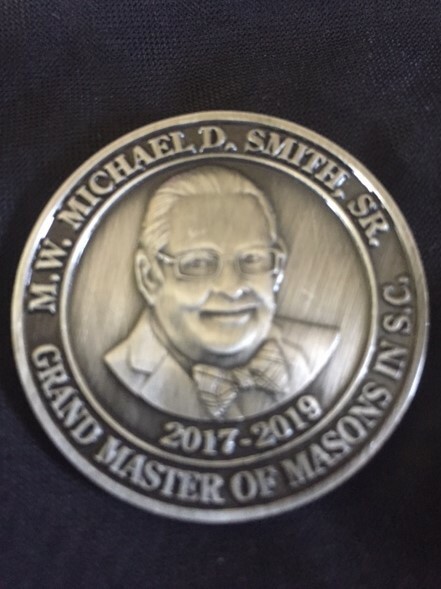 In 2004, Mike was presented the Albert Gallatin Mackey Medal by Illustrious and Most Worshipful Jack A. Marler, GM, the highest honor that can be presented by the Grand Master in South Carolina. In 2016, Bro. Mike was named as Grand Representative to Italy. Bro. 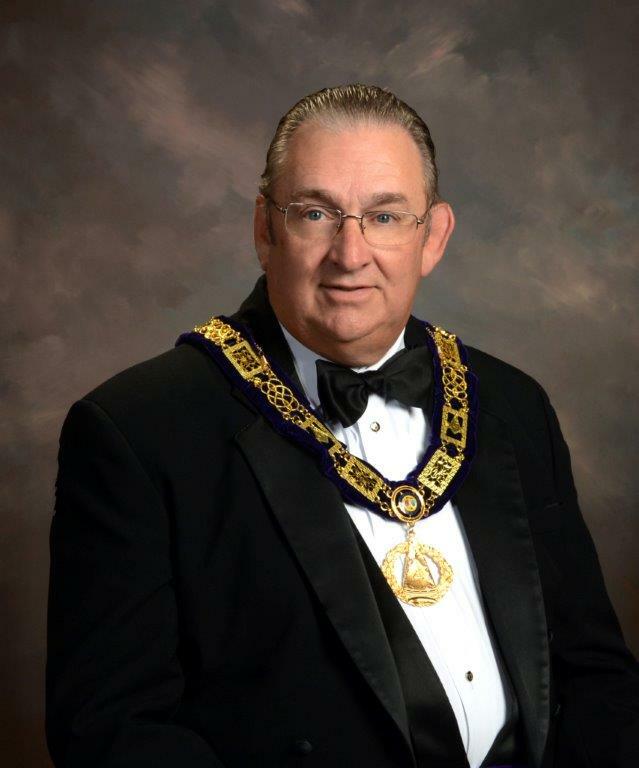 Mike was elected to serve the Most Worshipful Grand Lodge of Ancient Free Masons in South Carolina as Junior Grand Warden, on April 26, 2013 and elected to serve as Senior Grand Warden on April 24, 2015. He is active in numerous appendant bodies of Freemasonry and is a member of the Royal Order of Scotland, Member of Chicora Chapter # 33 Royal Arch Masons, Blake Council # 19 Royal and Select Masters, and Spartanburg Commandery # 3 Knights Templar in Spartanburg, Palmetto York Rite College # 70, Super Excellent Master of Aiken Council # 23 and Samuel H.J. Womack Council # 20 Knight Masons. Mike is also a Member of the Carolina Conclave of the Red Cross of Constantine. Mike was elected as a member of the South Carolina College of Societas Rosicruciana in Civitatibus Foederatis. He is a member of the Spartan Chapter # 153 Allied Masonic Degrees and South Carolina Masonic Research Society. Member of Palmetto Forest # 208 Tall Cedars of Lebanon, Legion of Honor Member of Palmetto DeMolay Association, Executive Class 3 Officer and Deputy of DeMolay International, Member in Perpetuity in National Order of Sojourners at Fort Jackson, # 184 and John Sevier Chapter # 548 and Ft. Jackson Camp of Heros of ’76. Mike is a member of Hejaz Temple of the Ancient Arabic Order of the Nobles of the Mystic Shrine. In 1982. Mike joined the Ancient and Accepted Scottish Rite Valleys of Spartanburg and Greenville. He served as Wise Master and Venerable Master in Spartanburg and also served as Class Director, Staging and Properties Director and Director of Work. Mike was invested with the rank and decoration of Knight Commander of the Court of Honor in 1989 and was coroneted 33° Inspector General Honorary in 1999. He was selected to serve on the 2001 Bicentennial Biennial KCCH Investiture Team which was held in Charleston, SC. In 2002, the Sovereign Grand Commander C. Fred Kleincknecht, appointed Mike as Deputy of the Supreme Council in South Carolina, at the age of 44. In 2003, he was elected as the Sovereign Grand Inspector General in South Carolina by the Supreme Council in Washington, DC. Today Mike serves as Grand Master of Ceremonies for the Supreme Council, Chairman of the Ritual and Ceremonies Committee, Fraternal Relations Committee and has served on the Strategic Planning Committee. He also serves as the Representative to the Supreme Council of Italy and Australia! In 2003, Mike was elected Chairman of the Scottish Rite Foundation of South Carolina, Inc., which operates 3 Rite Care clinics in Greenville, Columbia and Charleston. These facilities provide treatment of childhood language disorders for preschool aged children. Today these three centers serve over 60 children per week at no cost to the families. Since 2003, the Foundation served over 1810 families and a raised more than, $ 5.1 Million in support of the program.